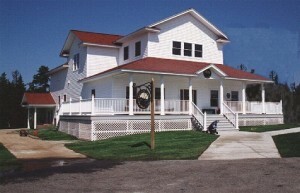 The Great Lakes Shipwreck Museum has become one of Michigan’s most popular destinations in the cultural tourism industry, attracting over 75,000 visitors each season. The museum is open every day May 1 to October 31, from 10 am to 6 pm. Museum patrons learn about the perils of maritime transport on the Great Lakes at the Whitefish Point Light Station, an Historic Site on the National Register of Historic Places. See the Whitefish Point Light Tower, in continuous operation for 155 years, the oldest operating lighthouse on Lake Superior. 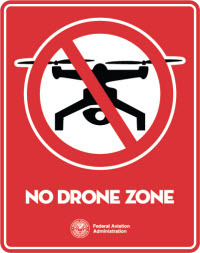 An unmanned aircraft system (UAS), sometimes called a drone, is an aircraft without a human pilot onboard. To climb the Whitefish Point Light Tower, all participants must sign waiver of liability. Participants must be able to physically climb 56 steps. No children under age 8 permitted, no exceptions. Must have appropriate footwear, no flip-flops and no bare feet. All cameras must have sturdy neck strap. Tours leave periodically throughout the day from the base of the Light Tower. Groups of 8 maximum per tour. Visitors enjoy walking among several historic structures, recently restored by the Great Lakes Shipwreck Historical Society. New facilities provide restrooms, meeting areas, food and beverages, and even an overnight experience in the 1923 Crews Quarters Building. For further information, please call toll-free 800-635-1742. After a self-guided tour of the Shipwreck Museum, visitors experience a 20-minute video presentation called Mystery of the Edmund Fitzgerald, now syndicated internationally by the Discovery Channel. This video tells the story of the most famous of Great Lakes Shipwrecks and the 1995 recovery of her bell at the request of surviving family members – fervently displayed in the Museum Building as a memorial to her lost crew of 29 men. 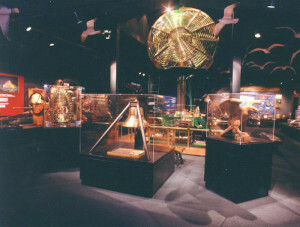 The waiting area of the video theatre features an exhibit about the Great Lakes Shipwreck Historical Society’s Underwater Documentation Project, 2005-2008, supported by the Michigan Department of Transportation and Federal Highway Commission. 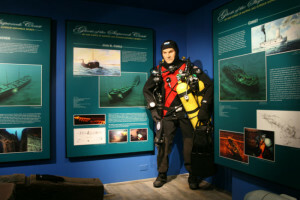 A fullly equipped technical diver mannequin is the centerpiece of this exhibit. Take a trip back in time on a tour of the fully restored 1861 Lightkeepers Quarters. You’ll hear first-hand accounts of keepers and their families who manned this side-by-side duplex building while tending the light. The Lightkeepers Quarters features period furnishings, descriptive panels, extensive exhibits and artifacts from the days of the U.S. Lighthouse Service and the U.S. Life Saving Service. Our experienced tour guides will direct you as you climb the stairs to the second floor, where you may enter the unique covered passageway to the base of the Light Tower’s stairway – that lightkeepers have climbed time after time for nearly 150 years. As the Whitefish Point Light Tower is still a fully operating U.S. Coast Guard Aid to Navigation. Visitors are allowed to stand in the tower base and look upwards at the wrought iron spiral staircase. The U.S. Coast Guard now allows the Shipwreck Museum to take small guided groups up inside the Light Tower. Guests may climb up the spiral staircase to the lantern room and step outside onto the walkway. Guests may not enter the top level of the Light Tower where the LED light is located. The view from the Tower is spectacular. On clear days you can see the mountains of Canada, Whitefish Bay and down the North shore of Lake Superior. You can sign up for a Tower Climb at our Shipwreck Museum building. We ask for a small donation and you will sign a Tower Climb Waiver. Please note, sturdy shoes are required and guests should be 8 years and older. Your donation goes towards our Tower Restoration Fund and is used to maintain the tower structure. 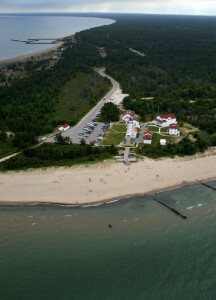 The U.S. Coast Guard kept a Lifeboat Rescue Station at Whitefish Point from 1923 to 1951, assisting countless mariners in distress and rescuing the entire crew of the sinking Zillah in 1926. 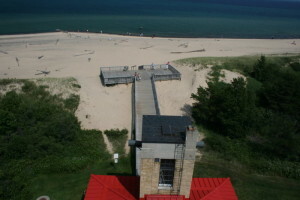 This station was equipped with two Surfboat Houses, one on the Whitefish Bay side of the Point for a motorized launch, and the second on the Lake Superior side of the Point, for a hand-pulled, non-motorized boat that could be quickly launched from the beach into a raging surf by skilled surfmen. 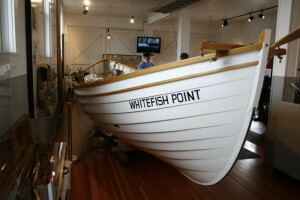 The Shipwreck Museum has preserved and restored this second Surfboat House, included with your tour of the museum campus. Exhibits tell the story of the courageous men and women of the United States Life-Saving Service, which came to Lake Superior’s Shipwreck Coast in 1876. The loss of lives here was so appalling that the USLSS established no less than four stations along this dangerous shoreline, the most concentrated number of stations anywhere on the Great Lakes. Whitefish Point is also a special area for natural habitat. Its sand dunes and beach grasses are environmentally sensitive, so the Shipwreck Museum constructed a barrier-free access boardwalk in 1998 to allow public access for everyone including those visitors with limited mobility. The boardwalk keeps visitor traffic away from the sand dunes. There are stairs at the lake end of the boardwalk to allow those who wish to walk on the beach. Constructed with financial assistance from Michigan Council for Arts and Cultural Affairs, one gets an excellent view of Lake Superior and passing vessel traffic, and on a clear day, a view of the Laurentian Mountains near Coppermine Point, Ontario. An historic story in itself, this “iron-pile” lighthouse was constructed to replace Whitefish Point’s original stone tower, which existed from 1849 until 1860 – the severe winds experienced here proved too much for its basic masonry construction. The U.S. Lighthouse Service successfully passed a bill through Congress in 1860 that allowed for the construction of many new lighthouses, including three on Lake Superior to light the way for the copper and iron ore trade. 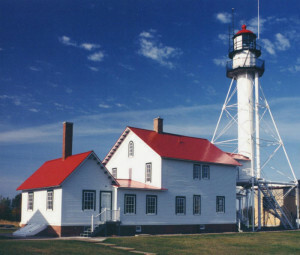 Lighthouses identical to Whitefish Point were built at Manitou Island and at DeTour, Michigan. An Ohio contractor followed the exact specifications of the Lighthouse Board, commencing his work on the light during President Lincoln’s administration in 1861. This lighthouse is strictly built of iron and copper – steel was too new to be trusted. The “piles” that have held it firmly against hurricane-force winds for so very long are not hollow pipes – they are heavy, steel, cylinders, designed to distribute forces against the tower evenly to its foundation. The designers of the tower would be astonished to know how long it has continued to function in its original purpose. The tower has had a series of lenses illuminated by a variety of methods. Its current light is a 1968 Crouse & Hinds aerobeacon; the lens immediately preceding was a third and a half order half-bivalve Fresnel lens that functioned from 1895 to 1968. 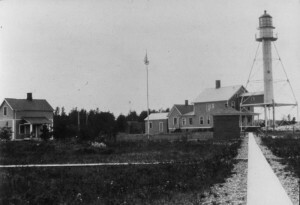 Commercial electrical service did not arrive at Whitefish Point until 1939. The Shipwreck Museum is currently seeking private contributions to complete light tower restoration, to match funding from the Michigan Lighthouse Assistance Program. Phase I of this two-phase project was completed in December, 2009. You can visit our Museum Store Online 365 days a year! Visitors to Whitefish Point are invited to see the new Museum Store building, located in the new construction zone of the museum campus. 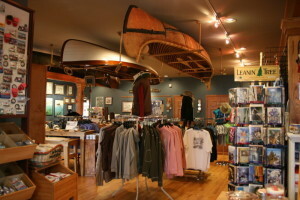 This building houses restrooms, meeting areas, and staff offices in addition to a large sales area offering Shipwreck Society signature clothing, books, video/DVD, souvenirs, original works of art and prints, models and games, all related to a maritime Great Lakes theme. There is a year-round branch of the store at the Society’s U.S. Weather Bureau Building in Sault Ste. Marie, Michigan.